Friends, family, and complete strangers gathered together in prayer. Prayer for our Little Boy. They knelt down in our driveway, sang songs of worship, huddled up in his room, and laid hands on his bed as they lifted our sweet Hayden up in prayer. 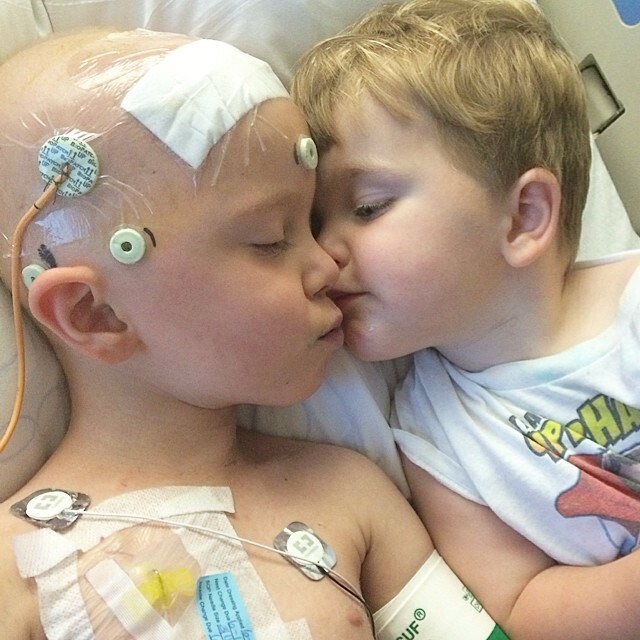 It had been nine long, hard, emotional weeks since he was first diagnosed with his brain tumor and this was the eve of his 3rd and biggest surgery. 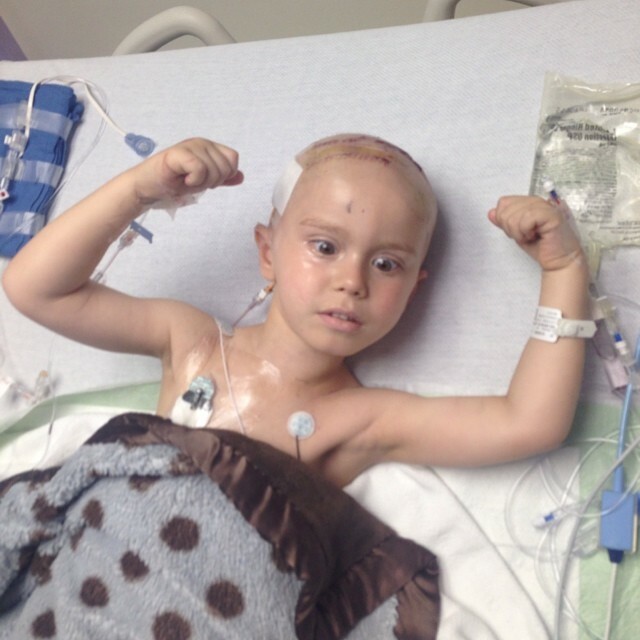 He had already undergone three difficult rounds of chemotherapy at St. Jude. And as this was talking place back home, we were sitting in an ICU room in Memphis, preparing to hand our son over to the doctors, and trying not to think about the possible complications associated with this surgery...loss of vision, speech, balance, seizures, loss of short-term memory, etc. As terrifying as that was, we were surprisingly overcome with a peace that definitely surpassed all of our understanding. And the next day we witnessed the power of prayer and an absolute miracle. God showed up in a big, big way and answered those prayers! We were told the surgery would last around six to eight hours. They were finished in three. We were told it could be days before he spoke. (The last surgery, we waited 13 hours for his first words.) Friends, within minutes of them allowing us to see him in recovery he spoke the words, "Do you want to see my muscles?" and "Did they got that bobo out of my head?" He was able to speak, but we were speechless. And in awe of God's goodness, grace, and mercy! Hayden recovered miraculously from his surgery, finished three more rounds of chemo, endured six weeks of proton radiation, and is now eight months cancer-free!!! We believe wholeheartedly in the power of prayer. We have witnessed it first hand. I'm sharing this with you, because we want you to know the heart behind Be the Light Project. We have gone through some very difficult and dark times, but even during those times, the light of Jesus still shone down on us. He answered prayers, performed miracles, and placed people in our paths that helped us through these times. Our eyes have been opened and our hearts transformed. We now know that life is so much bigger than ourselves and this world that we can so easily get wrapped up in. God used Hayden's brain tumor and Deacon's unexpected diagnosis of Down Syndrome to create a fire in our hearts. We have a burning desire to share the light that we have experienced with others. We still don't know what this looks like. We are constantly praying, talking, and dreaming about what direction this will go. But what we want you to know is that we are not at all about just selling a product and making money. We are about making a difference. And even if we can do nothing else for you, we want to pray for you. We care about you and what you are going through. We want you to share your stories and your heart with us, and we want to love on you. You who have lost a loved one. You who are going through a divorce. 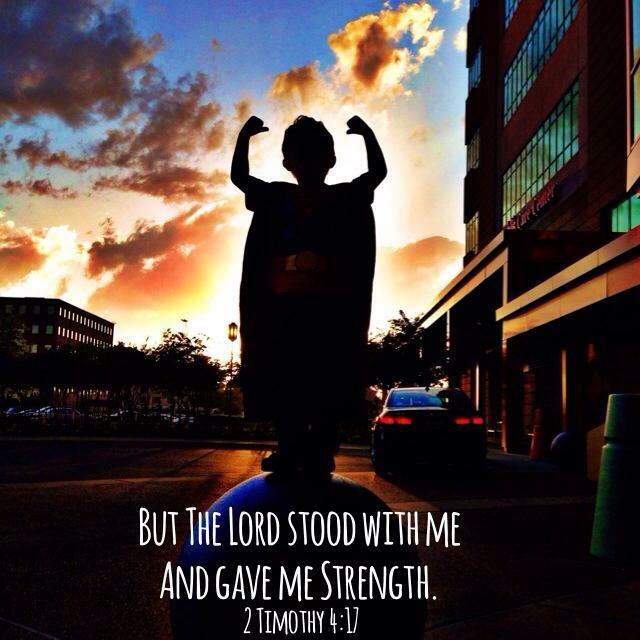 You who are battling an illness or have a child who is sick. You who are struggling with addiction. You who are struggling financially. Whatever it is that you are going through, we want you to know that you are not alone. Isaiah 42:10 says, "I will lead the blind by ways they have not known, along unfamiliar paths I will guide them; I will turn the darkness into light before them and make the rough places smooth. These are the things I will do; I will not forsake them." Deuteronomy 31:6 says, "Be strong and courageous. Do not be afraid or terrified because of them, for the LORD your God goes with you; he will never leave you nor forsake you." Jesus loves you, and He cares about you. And we do too. Will you let us pray for you? Send us an email at contact@bethelightproject.com or message us on Facebook. Send a direct message on Instagram. Leave a comment. Let us know if there is any way we could help you or how we could lift you up in prayer. It would be our privilege. What does it mean to BE THE LIGHT and why did we choose this name? Sadly, the world we live in today is full of tragedy, sin, and darkness. There is not much about this dim dwelling in itself that gives us as a human race much hope. To the contrary, there is our Lord, Jesus Christ, that is our light and salvation. In Him is where we find love, grace, hope, and restoration. Jesus said, "I am the Light of the World. Whoever follows me will never walk in darkness, but have the light of life." (John 8:12) We live in a dark place, but are given light when we choose to follow Jesus. The question we had to ask ourselves was...is this enough? Is it enough to just follow and receive the gift of life? It used to be for us. God had to bring us each through separate trials that brought us to places of complete brokenness before we were able to crack down the walls of our old selves and let His light shine through. Be the Light Project's name was inspired by Matthew 5:16 which states, "Let your light so SHINE before men that they may see your good works and glorify your Father in Heaven." You see, God doesn't just want us to receive His light, he wants us to BE THE LIGHT! It's a daily choice to shine and do good works for His Kingdom. We created this little shop in hopes that it would be a means for us to reach out and do something for others when we see a need and also to help fund an adoption. We give it completely over to God and pray that He will be glorified in each decision and product that is made. We are excited to see where He takes it!